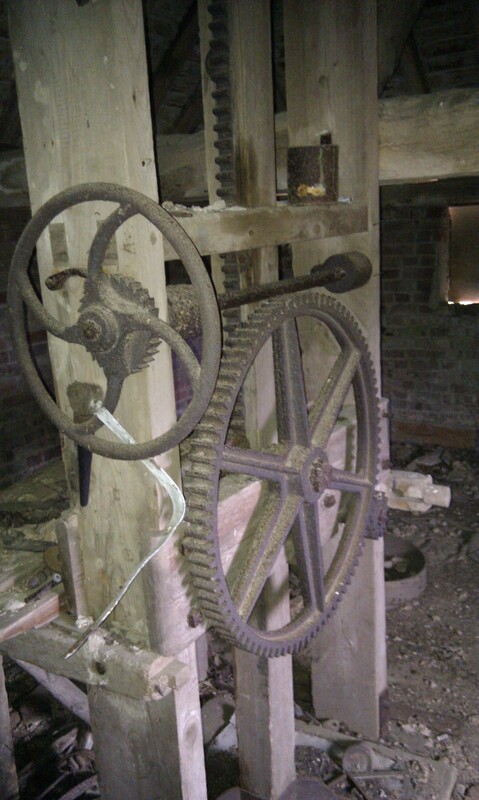 Upstairs in the oast is some built-in machinery which we have reliably identified as a hop-press – used to compress the hops into sacks, known as “pockets” . I assume that one would have turned the hand-wheel; a ratchet can be seen immediately behind it which would have stopped it being forced backwards. And I assume that the large cog drove the rack and pinion mechanism that can also be seen, which would turn the circular force into downwards force to act on the board which would have done the pressing. But then the force from the handwheel would have needed to go through a right-angle to drive the large cog, and I can’t see anything which would do this. Possibly missing. It would be nice one day to get all this working again. At the moment it is rusty and immobile.